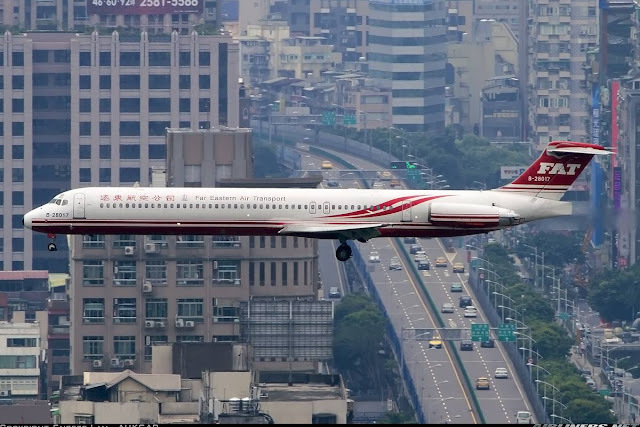 My plan in Taipei was to fly some domestic routes, cities that I haven't visited so far. The cities I had flown to previously was Kinmen, an island near to Xiamen, China. You can check out my previous trip report with this airline. Flying with Far Eastern Transport (FAT) was definitely in my mind, for the MD-83. This aircraft type is hard to find these days especially in Asia. Singapore used to play host to a few in the past, but from 2014 onwards, there wasn't any left when United Airways from Bangladesh pulled out from Singapore. What's the difference between the MD-82 and MD-83? 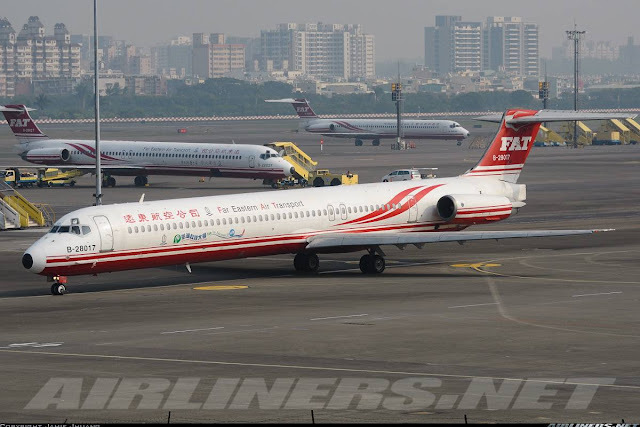 The exterior is exactly the same, only thing different is the MD-83 flies longer range than the MD-82, in other words, its an MD-82 (ER- Extended Range). So hopefully, one of the legs - I get to fly on it. 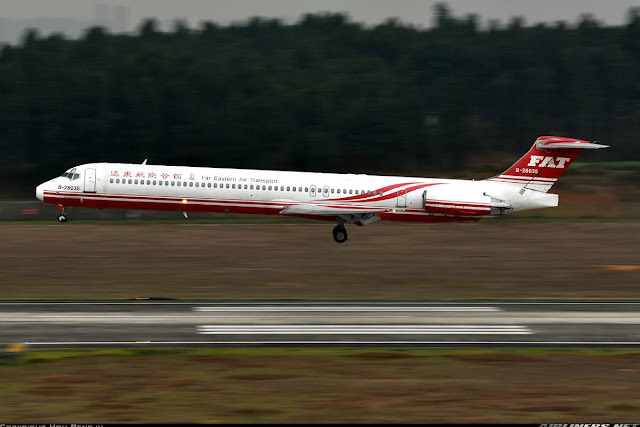 At this time (October 2014), the airline operates the same number of MD-82 and MD-83 (4 each) and it comes to your luck when it comes to knowing what aircraft would you be getting. Most importantly is not to get the same aircraft, the one I flew on before is B-28021. I looked at FAT's website, its the same as before - only available in Mandarin. Fortunately, I was able to read it and made my booking very quickly. The airline operated on 2 routes only from Taipei Songshan; Kinmen and Magong. No-brainer which route I would choose this time, Magong (Makung) definitely. It is on the island of Penghu near to Taiwan and is the city worth visiting? Read on to find out! Took a boat ride to Danshui which cost NT$300 = S$12 which took around an hour. The scenery especially in weather like this is worth it. Can you see the brown and blue boat? That was my ride. A few others like myself decided to enjoy the view from here, it was quite a sight. I always enjoy watching the sunset at Danshui's river. Sun is almost gone, see you tomorrow! Very fortunate to have such good weather in town! Photo taken from Elephant Mountain, the climb was worth the effort, you get to enjoy views like this. On the day itself, I woke up around 6 am and took the first train to Taipei Songshan Airport along the Wenhu line. I had to change train at Zhongxiao Fuxin station on the Bannan line, very convenient. Once there, I made my way to the check-in counter which was not opened yet. However, there was a queue so I joined in and waited until it was my turn before grabbing my breakfast at 7-Eleven. Fortunately, my flight was on schedule. One thing to take note when you check in for domestic flights in Taiwan is that you have to go to 2 different counters if you need to check in your luggage. First is to get your boarding pass at the check-in counter then after that, you have to come here (luggage check-in) to check-in your luggage. On a crowded day, it can be very time consuming. Boarding pass is much nicer than the supermarket receipt types. Went to the monitor screen to check my flight. Looking good so far! Off to the boarding gate. This was my boarding gate and my aircraft, B-28017 is my ride. Credit goes to these photographers! Once on board the aircraft, my impression of the airline was disappointing. The crew weren't so welcoming; a couple of them were just watching at the seats, not saying a word to walking passengers. One obvious observation was the interior was different from the MD-80 I flew on with this same airline a year ago. It was definitely an upgrade over the previous, but one thing didn't change - the seat pitch was miserable. I suspect it should be around 29-inch. Unfortunately, I was sitting at the 3-seater row and had 2 medium-size built gentlemen sitting beside me. The aircraft was filled with mostly teenagers heading there for a vacation. Fortunately, it was a short ride so tolerating the terrible seat pitch for this duration was bearable. Taiwanese civil aviation is very strict about using electronic devices on board the flight especially during in-flight which is something I cannot understand. Here are some of the quick photos I took while everyone else was still at the boarding gate. This was my seat, look at how miserable the seat pitch is! Thankfully, the last crew was in front so I was able to photograph these shots. Only a drink and napkin were served on this short flight, I had a cup of Taiwanese tea. This set of cabin crew were not very good, they seemed to want to end their day early to rest. If they were tired, then that's not an excuse! Their job is to help passengers in any way to make the flight more comfortable for them. With smiles from them, passengers especially nervous ones will feel more at ease and that's what I believe. Waiting anxiously for the aircraft to push back. Once it did, it was thrilling to hear the PW's JT8D engines starting up - music to my ears! Weather didn't look good so I was expecting a bumpy ride! The take off was different from others. The pilots throttle up the engines before releasing the brake and we had a very powerful take-off as a result! Sitting on the right side especially taking off from runway 10 at TSA will give you spectacular view like this. Hardly any turbulence during take-off. That's how flying should be like - clear blue sky and enjoying view like this. The mountain looks very close, we were at flight level 160 (16,000 feet) at this time. At this time, I wouldn't mind a go-around (abort landing and circle another round for landing), the ride went passed too quickly for my liking. A soft kiss of the ground and we landed just on time. Here are the videos of the take-off and landing, please enjoy! The airport is quite small, with only a few airport gates at the apron. Those gates are catered only for the MD-80 and ERJ190. My first impression of it is similar to Kinmen's airport, small but easy to get around, thanks to the signs which is available in both Chinese and English. Photography is allowed in the building but not at the tarmac as there is considered a military base. What do you think of the interior? Lots of seating area in this airport and because it has shut down its international flights over here, the airport is hardly busy even during the peak hours. There is complementary wifi at this airport, however the connection is weak and I would suggest you to go near the Mandarin Airlines check-in counter on the 1st level or 2nd level as long as you are at that section, you should be able to receive average connection. There is no restaurant or cafe at the airport, so if you want to fill up your stomach, you have to get it in town before making your way to the airport. However, there is 7-11 at the arrival hall, limited choices though. There is a mini-library at a corner where passengers can explore them, similiar to the one in Taipei Taoyuan Airport. Cannot decide where to go? You can check this out or ask the visitor's information to help you. They were very helpful to me and gave me all the necessary information I needed. On the 2nd level, there is where you head for the domestic departure air-side. An overview of the 1st level, not busy at this time. It was around 5 plus on a weekday. I spent about 7 hours in town before making my way back to the airport. It was about 7.3km from where so I attempted to walk to the airport, only walked until about 2 km away from the destination then I decided to talk a cab to the airport. The reason was that stretch onwards was more of a highway so it was a bit awkward to be walking along it and it was a good decision. This was my first time sitting on the left side of the MD-82 aircraft. For my previous rides on this type, it was on the right hand side. Sun set at Makung Airport, I was blessed with good weather! Meanwhile, a Mandarin Airlines ERJ190 preparing for departure to Taipei Songshan. At the air-side, this was the boarding gate area, pretty empty at that time. A gift shop which is located at the air-side. I always enjoy watching sun set and this time I enjoyed it at my favourite place, the airport, waiting for my aircraft to arrive. Looking good so far, hopefully no delay and my flight was to be the last flight of the day for this small airport. My plane arrived and when I saw the 2 numbers just above the cockpit, 35? I was disappointed because this was another MD-82. I guess the MD-83 were flying on international routes and it make sense since this aircraft type has a longer range then the MD-82. At least it was a new registration for my flight-logbook. I didn't take much photos for this flight as the seat cabin is similar to the previous. Cabin crew is directing the passengers to their seat. Seating at this row, I was wondering how quiet would this part of the cabin be when taking off. The seat buckle is different from any other aircraft I flew on. It took quite a while for me to figure how to fasten it. Some other passengers had difficulty with it as well. There was no explanation of the flight delay but an apology was issued. The cabin crew were pretty moody and weren't in the mood for anything. Perhaps the delay caused some inconvenience to their private lives? No doubt among my Taiwanese flights for this trip, this batch of crew was the worst lot. I was pretty unimpressed with them and even when they served drinks, they did it in such a hurry that luckily the hot tea didn't spill on either my seat mate or myself. The Captain did announced in both English and Mandarin updating us about the flight and our arrival time. The service on board my flights this time was disappointing. Taiwanese is well known for its wonderful hospitality but I didn't get to experience any of that on my flights. 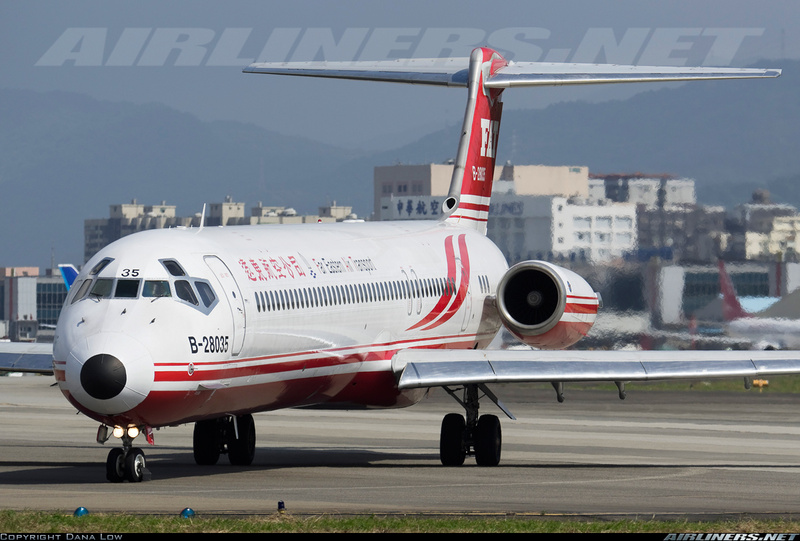 Flying on the MD-80 is a must for all aviation enthusiasts especially if you are flying to Taiwan for vacation. If you are a non-Chinese, you can purchase your tickets at the airport or ask a Chinese friend to book it for you, there is no English website for this airline. Makung doesn't really attract me much, it reminds me of Jeju Island in South Korea. I think a day or at the most two days are enough to explore the city. Thank you for reading my trip report, hope you have enjoyed it.